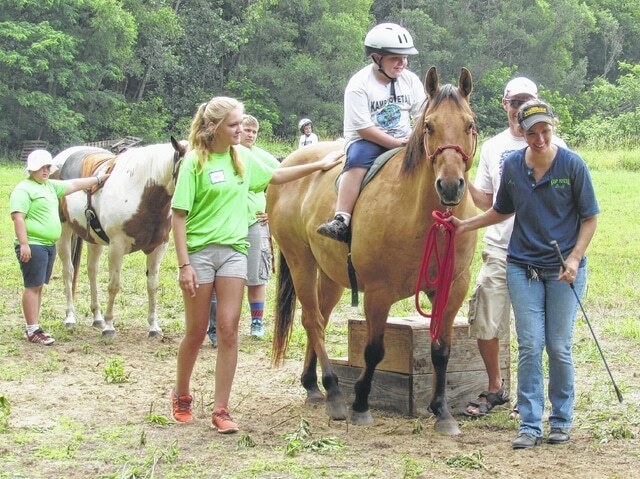 Above, campers are pictured riding horses with KAMP Dovetail volunteers and staff. This year’s KAMP Dovetail event is in full swing at Rocky Fork State Park, where hundreds of campers and volunteers are enjoying some summer fun. KAMP (Kids And Motivated People) Dovetail has served thousands of special needs campers and their volunteer teenage partners since it first began 34 years ago. According to director Linda Allen, “We do everything just like every other camp,” such as riding horses, fishing, boating, swimming, and arts and crafts. The theme for 2015 is “Around the World in Five Days.” Allen said each year’s theme is decided two years in advance during a brainstorming session. For example, Allen said each meal includes a food from a different country, such as baklava. She added that after being served during meal times, campers are instructed to say please and thank you in the native language of their group’s assigned country. Meals, Allen added, are served by different local organizations. On Tuesday, Lions Club members were serving lunch to the campers. Allen also described different activities that have been designed around this year’s theme. One such event was a World Citizen Pageant, which was held Monday evening and was similar to a Miss Universe competition. Other activities include a hot air balloon (which the campers will watch), field games, and a dance. On Wednesday, a carnival will be held. The public is welcome to attend this event which, according to Allen, “brings out a lot of people.” According to a camp schedule, the carnival begins at 7:30 p.m.
Allen said that each year’s carnival features a dunking machine, where campers enjoy getting the chance to dunk their group leaders. The carnival will also include an auction, with the funds going toward this year’s camp. Available items will include homemade baked goods, sports memorabilia, and furniture. Allen added that since the items are donations it is difficult to know the exact number and variety until the day of the auction. “People know it’s for a good cause,” she said, adding that Ohio State Representative Cliff Rosenberger once bought a cheesecake for $600. “We bring in around 16 horses,” Allen said. She added that about three to four volunteers accompany each rider. The boat rides, she said, last 30 to 45 minutes. “It’s a pretty good ride,” Allen said. She added that during each ride the boat operator makes one of the kids a “captain” and lets them drive the boat. Campers also have the opportunity to go fishing. As of late Tuesday morning, campers had already caught 10 to 12 fish, Allen said. During their arts and crafts activities this year, campers are making passports. According to Allen, campers receive stickers for each area they visit. She added that recreational activities for the campers include “all kinds of activities,” such as jumping houses. Day-campers, she said, participate in the same daily activities, but also have their own area where they can stay with kids their own age. One year, she said, there was a horse and carriage group from Lynchburg who called the camp and asked if they wanted to cancel due to stormy weather in the Lynchburg area. Allen said the group ultimately came anyway and that as soon as they got to North Shore Drive the rain stopped. Everyone else, she said, was “soaked” except for the camp. Allen said it takes about 700 volunteers to pull off a week at KAMP Dovetail. One volunteer, Allen said, is Kat Cioca, who paints the backdrop for the campers’ group photos every year. Each camper gets both a group photo and a T-shirt. Cioca has been volunteering with KAMP Dovetail for 11 to 12 years. Originally from this area, she moved to Nashville a few years ago, but comes back to Highland County for the camp each year. For more information, or to find out how you can get involved, go online to www.kampdovetail.com.